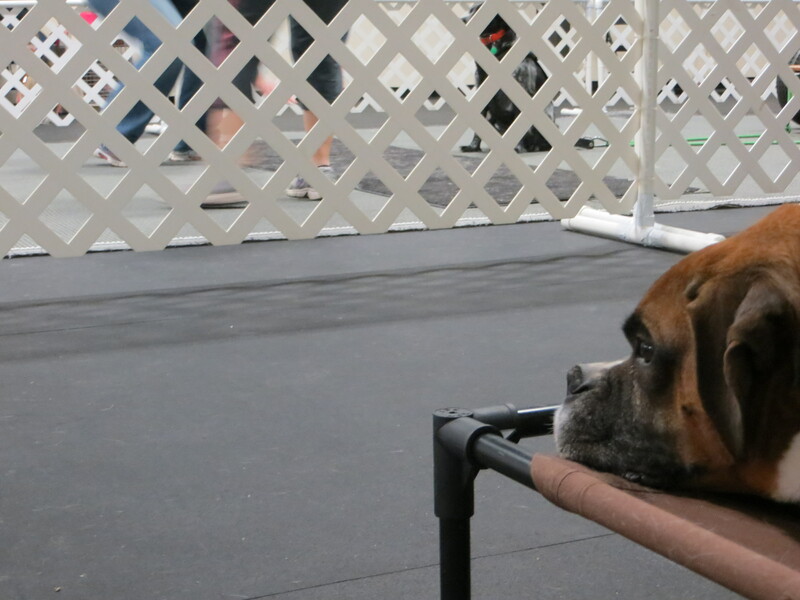 Weight Pull: Dragging is not a Drag | All Around Dogs Weight Pull: Dragging is not a Drag | Thoughts on training and life with dogs. Tonight Dash and I finally got “back on the horse” after his injury sidelined him last fall. We’re taking a new approach to his training, focusing much more on initiation and completely removing treats from the picture during his pulls. Part of why I believe I did not see his injury sooner is that I had been dependent on treats. Since treats actually get him a bit overstimulated, I believe the combination of adrenaline and motivation kept him working when he was hurt. When I began to fade food, he started giving me trouble during practice, but we thought he was copping an attitude about the lack of immediate payout. When we reached the trial where there was no food and I couldn’t touch him without being penalized, he would not pull the empty cart despite having pulled far more many times before. The only downer is when it’s not your turn. Tonight’s practice was a success. He was game for action even though I did not lure him with food. I’ve always felt that he enjoyed pulling and having a job and it appears I was right. He didn’t need food present or even mentioned to do the work. We had to find the weight that would force him to focus and initiate without making it too difficult. A carpet sled (sled w/carpet on the outside for friction) with a half cinder block plus a brick or two turned out to be the winning combination for us. He had to commit to get the sled moving and wasn’t able to move at a full sprint. But it wasn’t so difficult that he got frustrated or quit. He still got a hearty reward for his successful efforts. We went out to the car for a portion of his dinner of “special” (not his usual formula) kibble and a quick drink of water each time he completed a pull that required him to initiate and commit. He got his entire dinner and a healthy portion of dessert. And he earned every last bite. Now that the weather is getting warmer and the days are getting longer, I’m hoping to institute a practice schedule at home to help him build his muscle and his commitment to the work. We’ll practice with chains in the driveway and (when it’s drier) the yard and I may even look for some local places so we can take our work “on the road.” I look forward to getting back into the swing of things with my boy.